Green coffee contains chlorogenic acid (GCA) main active ingredient for weight loss. Chlorogenic acids which have been shown in scientific research to help you lose weight. Green coffee extract is an extract of unroasted, green coffee beans. Green coffee extract has been used as a weight-loss supplement and as an ingredient in other weight-loss products. Its efficacy and mechanism of action have been the subject of controversy. Green coffee beans are rich in antioxidants, which reduce the damaging effects of free radicals in our body and take care of our overall health. A number of studies have confirmed that raw and unprocessed green coffee beans possess 100% pure Chlorogenic Acid (CGA), which is basically an ester of caffeic acid having strong antioxidant properties. It can put a check on the levels of glucose in our bloodstream and prevent our skin cells from getting dented. Green coffee bean contains a natural antioxidant which not only facilitates quick weight loss but improves the process of skin cell renewal. Due to this fact, your look improves every day and effectively purges the body from toxins and excess fluid by washing them out naturally through the intestine. Green coffee beans are rich in antioxidants, which reduce the damaging effects of free radicals in our body and take care of our overall health. As Green Coffee Beans contain the high amount of caffeine, it can be used as an excellent energy booster. It will let you remain active the entire day and keep you active. The composition of coffee beans contains substances and elements that accelerate fat metabolism in the body. The faster metabolism in the human body, the quicker it breaks down the fats. It also detox the body and cleanse the excess fluid and help to loose down the excess weight. Green coffee beans are very effective in enhancing our immune system. Due to the presence of free- radicals, it can help our body to eliminate all type of damaging and toxic components. Green coffee bean extract is a natural detox. It cleanses the liver to get it free from toxins, unnecessary fats, and bad cholesterol. With the detoxification of the liver, it functions in a better way which increases the metabolism and makes good the entire health. To your surprise, green coffee beans can also treat Type 2 Diabetes without any side effects. Coffee bean extract can lower down high levels of sugar in the bloodstream, which can further assist in weight loss. 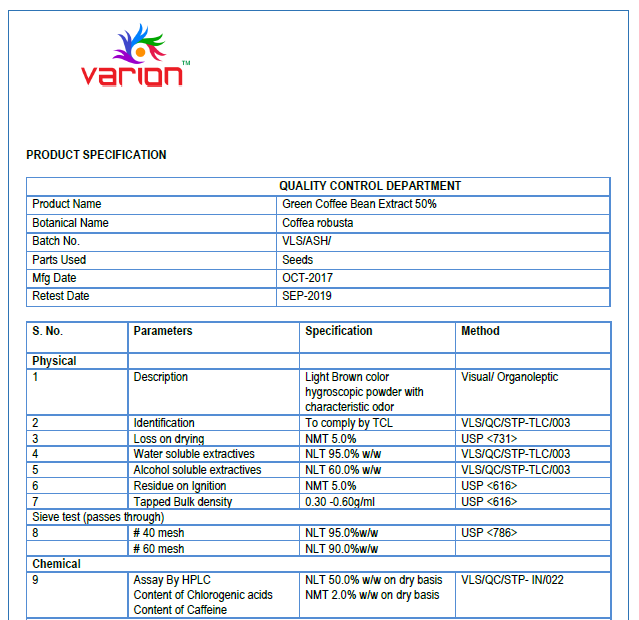 Green coffee extract manufactured by Varion Lifesciences Pvt. Ltd has been proven to be effective in managing obesity. The extract has 70% of chlorogenic acid and free from caffeine. It is advised to consume a minimum of 400mg per day to get the desired effect.